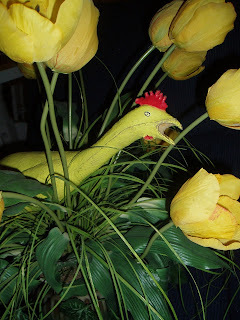 I was a spring chicken when I joined the Hubert family. My body was sleek, paint unchipped and I had a squawk that put nails on a blackboard to shame. My love of travelling began when my new family took me on their European vacation. Since then I’ve visited over sixteen countries and became the star character in Mom’s stories. As you can see, I even have my own blog. Although I’ve had a wonderful time, the years have taken their toll. My squawk box is worn out and I’m in dire need of plastic surgery. My beak has hardened and is in danger of falling off, (or crumbling). Despite an extensive search, we’ve yet to find a rubber chicken rehabilitation service. I’d like to take a break some times and lie by the pool drinking Gatoraide, but can’t until we find a twin to assist with my duties. I’ve scoured local stores and the internet with no luck. Even EBay came up empty. If anyone has a rubber chicken that looks exactly like me, Mom would be delighted to give him (the chicken) a loving home filled with fun and adventure and a monetary reward. 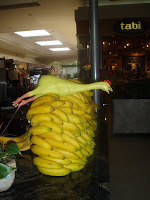 Please send pictures (more than one at different angles), of available rubber chickens to rubberchickentogo@hotmail.com . Remember, I’m looking for an exact replica (minus wear and tear). I’ve also attached a few pictures. If I have any more family members out there, now is the time to make your self known. Hello out there. It’s me; Bob, Bob Hubert. Yeah I know. I’m a rubber chicken, but not just any rubber chicken. When I was created, a lightning bolt zapped the rubber chicken factory and zig-zagged down the assembly line smacking me right in my squawk box. Shazzam! That volt turned me into Bob; a walking, talking rubber chicken. Unfortunately, the factory workers didn’t get my specialness and shipped me off to a department store where I sat on the shelf for a really long time. Finally a boy named William Hubert heard my squawk for help and bought me. I became part of the Hubert family. William has a Mom, Dad and nasty teenage sister named Meghan. Since then I’ve travelled the world and shared lots of adventures with my new family. Hey guys, join the flock and share my travels as I give you a bird’s eye view of some really cool places. Check my blog every Tuesday and Friday for updates. Welcome to ‘Travelling Rubber Chicken.com’.